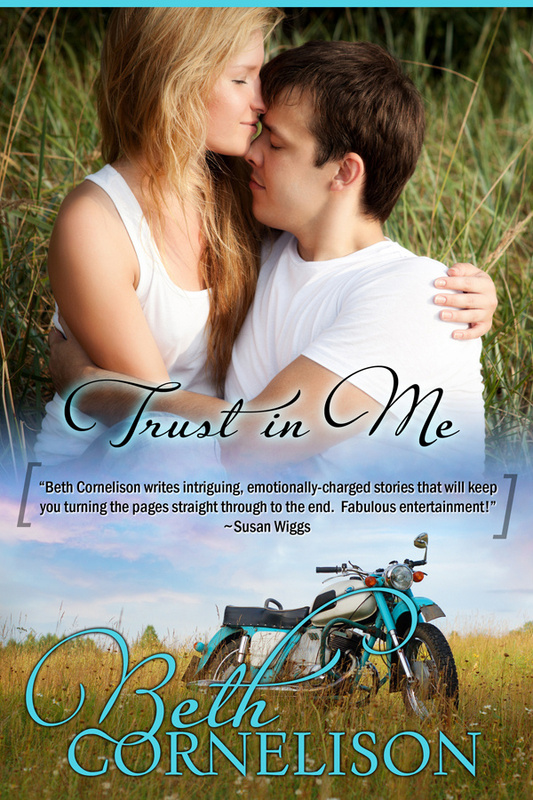 I’m very excited today to present Beth Cornelison, author of many wonderful books for Silhouette Romantic Suspense, HEALING LUKE from Sourcebooks Casablanca, REYN’S REDEMPTION and UNDER FIRE from Samhain, and TRUST IN ME, a small town romance perfect for bathtub or weekend reading and, best of all, FREE for the next few days for the Kindle. Here’s Beth to talk about the book in her own words. Enjoy! Thank you, Lucienne, for the opportunity to set the scene of my small town contemporary romance, TRUST IN ME. First a story, then I’ll tell you how you can get TRUST IN ME for FREE! The summer after I finished sixth grade, my family moved from Missouri to Augusta, Georgia. One of the benefits of this move was that we were now four hours away from my grandmother, who lived in Asheville, North Carolina, instead of sixteen hours. My mom took advantage of the chance to visit her aging mother as often as possible, meaning my sisters and I also made the trip. I loved the opportunity to visit with my grandmother, but just as I have cherished memories of the time at my grandmother’s house, I remember well the drive through rural South Carolina to reach Asheville. In particular, I remember driving through Clinton, South Carolina, a picturesque small town and home of Presbyterian College. Clinton became my model of small town life and beauty when story ideas and characters for TRUST IN ME started whispering in my mind. The tall ancient oaks lined the streets with branches that ached over the road to create a shady tunnel of greenery. The old homes, both large and small, harkened to a bygone age. The railroad tracks we bumped over at the center of town and small businesses that lined the main street— barber shops, hardware stores and drug stores— were reminders of the days before superstores and malls ruled the retail landscape. Home owners’ well-tended lawns blossomed in summertime with a rainbow of flowers and blooming shrubs. I can remember rolling down my window just to catch a whiff of the floral scents that perfumed the air. In a residential area of Clinton, we’d pass the lovely campus of Presbyterian College with its stately Georgian style brick buildings and shady quads, and I began forming ideas of the sort of college campus I wanted to call home when I graduated high school. Not far from town, along the country highways that crisscrossed the state, peach orchards and vegetable gardens yielded crops that were sold in the numerous roadside stands. I have never eaten a sweeter, more delicious peach than the ones grown in western South Carolina. Large pastures with cows idly grazing, farm houses and mobile homes with dogs sleeping in the sun added to the slow-paced, nostalgic feeling of this beautiful small town. Time passed, and I married and moved away from Georgia. My grandmother grew ill and needed to be placed in a nursing home closer to my mom, and I was no longer making that trip from Georgia to North Carolina via Clinton, South Carolina. Yet when I started writing TRUST IN ME, Clinton was burned in my brain as the idyllic setting for my small town romance. My hero, Kevin, worked in a family owned hardware store like the ones that lined Clinton’s main street. Heroine Claire dreamed of attending Harrison University, based on Presbyterian College, and she rented a room from an elderly lady who lived in one of the old homes with a bounty of sweet smelling flowers and dogwood trees blooming in the yard. Kevin lived in one of the mobile homes outside the town limits and even had a stray mutt who adopted him. I also had the owner of one of those roadside peach stands came to shop at Lowery’s Hardware. Although I changed the name of the town so that I could take some creative license, the inspiration for my small town of Grayson came from those summertime trips up and down the highways between Georgia and North Carolina, and my fond memories of Clinton, South Carolina. You’re so welcome. It was at #97 in the free Kindle store just now when I checked!